Unsuitable Thoughts - Family Times is an award-winning magazine with staff-written news, feature stories and artwork that inform and inspire Central New York parents and their children. When you go shopping for a bathing suit, it’s like stepping in quicksand. You browse the racks and carry armfuls to the fitting room, but once you enter your own tiny stall, that sinking feeling sets in. The longer you stand in front of the harsh lights and full-length mirror, the more your confidence erodes. And from the moment you try on that first swimsuit, the voice in your head starts pulling you down. Funny how a mirror—something that doesn’t have eyes, a brain or a mouth—nonetheless sees you, judges you and tells you everything that’s wrong with you. I suspect my daughters hear the same voice. It wasn’t always this way. In old family albums, Jaye and Em are un-self-conscious in matching swimwear. A parenting article had convinced me that these “sister suits” would make them easier to spot at the beach, pool or water park. Convenient for me, but in hindsight, cruel for the girls, who were two years apart. In a sense, swimsuit shopping for kids is investment dressing: You want one that will stand up to a full season of wear, but you don’t want to overspend, since it’ll be too small next year. We’d typically start our search in April, with weekly trips to discount stores. If mid-May found us empty-handed, we’d head to department stores for a wider selection, albeit higher prices. The girls had strong opinions and ignored my efforts to steer them toward practical styles. They’d scream “Ewww!” at anything black, dark, lacy, shiny, or ornamented with bows and ruffles. Like pollinating insects, they’d beeline toward fluorescent pink, yellow and orange. Inside the fitting room, if they found a suit they liked, they’d jump, twist, do karate kicks, or pose in a cannonball plunge into a pool or a skid down a water park slide. The girls had seen enough wardrobe malfunctions to want to avoid them. At this age, bathing suits had only good associations: the end of school, summer play dates with friends, sunshine, hot weather, boating, beaches. Long before adolescence, however, the shift occurred. The girls went negative and started using the “F” word. I don’t know whether she believed it or was simply going along with friends who said that about themselves. Since Jaye had always been on the skinny side of normal on the pediatric height/weight charts, I didn’t take it seriously. Then Em began parroting her sister. Restless, rambunctious Em—so busy she could barely stop to eat, so skinny she routinely fell in the 10th percentile for weight up through middle school. I thought my girls would be immune. They weren’t. Few are. In a 2009 study at the University of Central Florida, nearly half of the 3- to 6-year-old girls surveyed said they were worried about being fat. 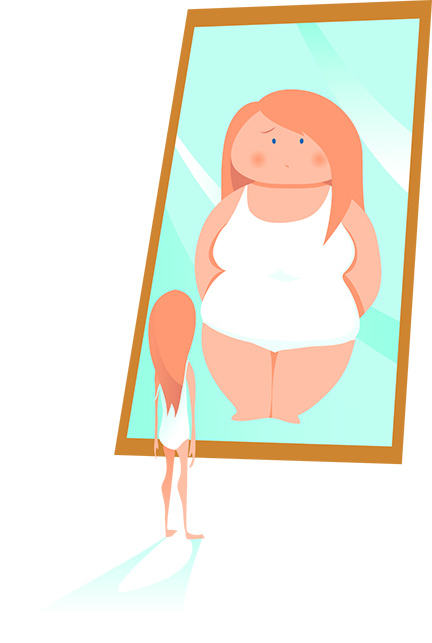 Research shows that young girls who worry about body image are at greater risk of developing eating disorders as they grow older. I’ve subsequently learned to stay on top of pop culture trends so I know what my kids are up against. Like the “thigh gap” (the space between the thighs when the knees are together) and the “bikini bridge” (when the wearer’s stomach is so concave that the bikini hangs between the two hip bones). Sickening, isn’t it? Yet impossible expectations and crazy trends will always accompany swimsuit season. So when that voice starts up in your own head, pay attention. Not to the words themselves, but to the impulse to negate your self-worth. Think about the messages you might share with your kids to counter this self-talk. Acknowledge that we all have that voice inside us to some extent, but that we shouldn’t surrender to what it says. How we feel in our swimsuit or birthday suit hinges on self-acceptance and self-love. It’s a glow that lasts longer than a tan, a radiance no moisturizer can deliver. A truth so simple we don’t say it enough: Being comfortable in your own skin is the most attractive quality of all. Linda Lowen lives in Syracuse with her husband and two college-age daughters, who go by Jaye and Em in her writing.